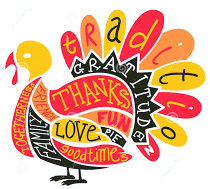 The OFCS district will not hold classes Wednesday, Nov. 25th through Friday, Nov. 27th to observe Thanksgiving break. School will resume Monday, Nov. 30th. Enjoy your turkey day. Happy Thanksgiving! The OFHS Masquers will present a high impact drama this week for its fall performance. 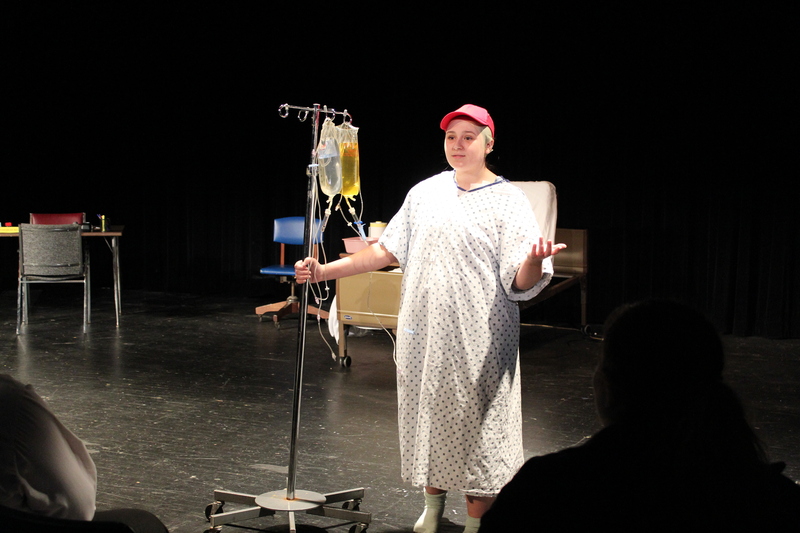 “Wit,” a story that deals frankly and openly about coping with cancer, has our high school thespians breaking new ground. 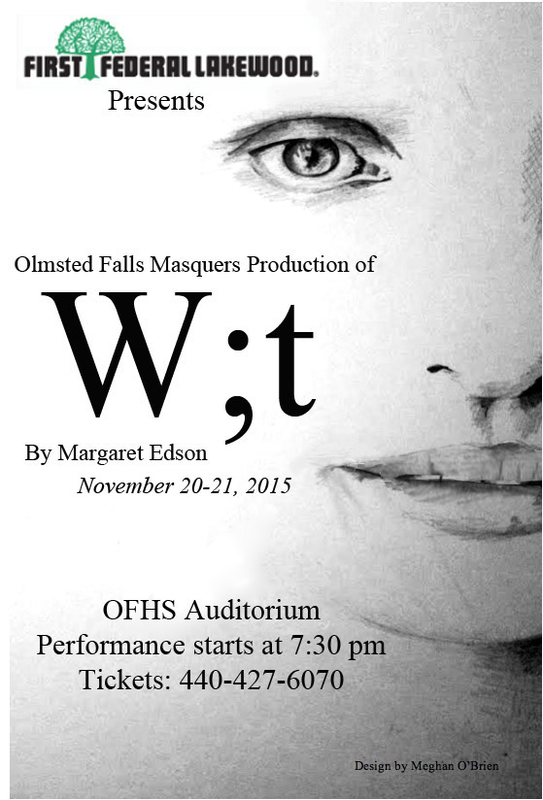 In the past 30 years, this is only the third drama produced by OFHS Masquers and it is sure to impress audiences. While the subject matter – dealing with issues of life and death – is NOT SUITABLE FOR YOUNGER CHILDREN, older students, parents, family members, friends and community residents in attendance will be in for an impressive and emotional performance. Unique to this year’s fall play will be the stage’s “black box” format which puts audience members right on the stage with the cast. To accomplish this sophisticated set-up often found in professional theater productions, an addition has been built on to the front of the stage. There will be only about 150 seats available each night. The play itself is not long – only about 90 minutes total – so there will be no intermission. The actors are performing some of the most challenging and powerful work ever staged at OFHS. OFHS Masquers hopes you will plan to attend this very special performance scheduled for next weekend at 7:30pm in the high school auditorium. Performances are TONIGHT, November 20th and Saturday, 21st at 7:30pm. Tickets are $5 for students and senior citizens; $7 for adults. The Bulldog varsity volleyball team had its most successful season since 2008, winning the SWC with an 18-0 record and had an overall 22-2 record. 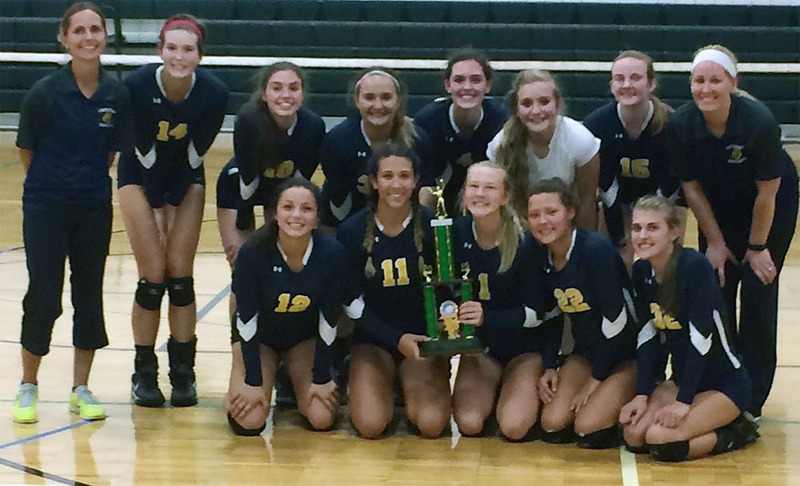 In the last week of the OHSVCA Coaches Poll, the Bulldogs were ranked eighth in the state. Varsity team members include seniors Katie Edgington, Lexi Lombardo, Nikole Glatt, Maddy Morin, Julia Korek and Paige Tymke; juniors Kacie Burton, Julia Jones and Taylor Letterle; sophomores Chase Filicko and Leah LaPinta and freshman, Jeanie Edgington. Fun fact: 88% of the varsity volleyball team has a GPA of 3.5 or higher. Congratulations, team. 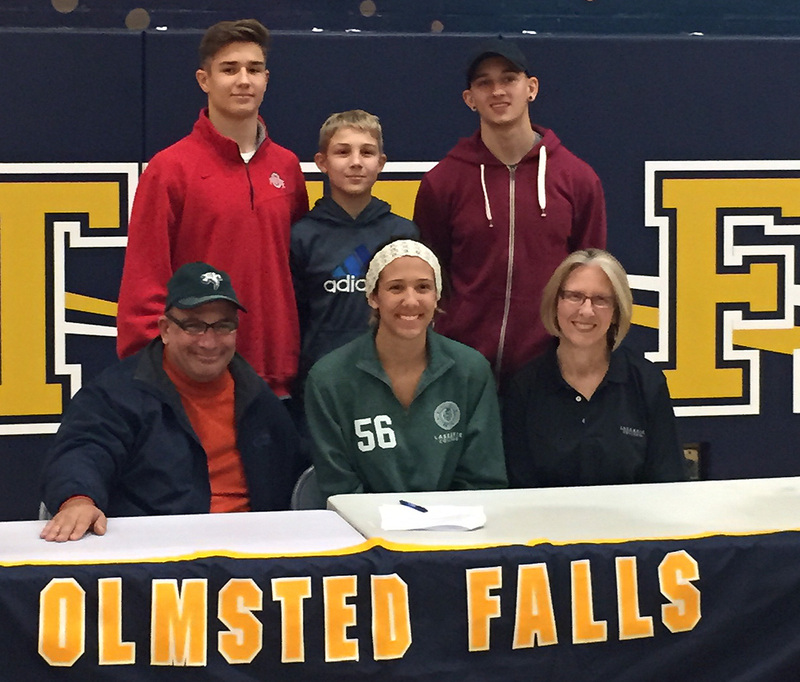 Bulldog seniors Lexi Lombardo (picture on left with her family) and Katie Edgington (pictured on right with her family) both signed full volleyball athletic scholarships at OFHS during a signing ceremony last Friday. 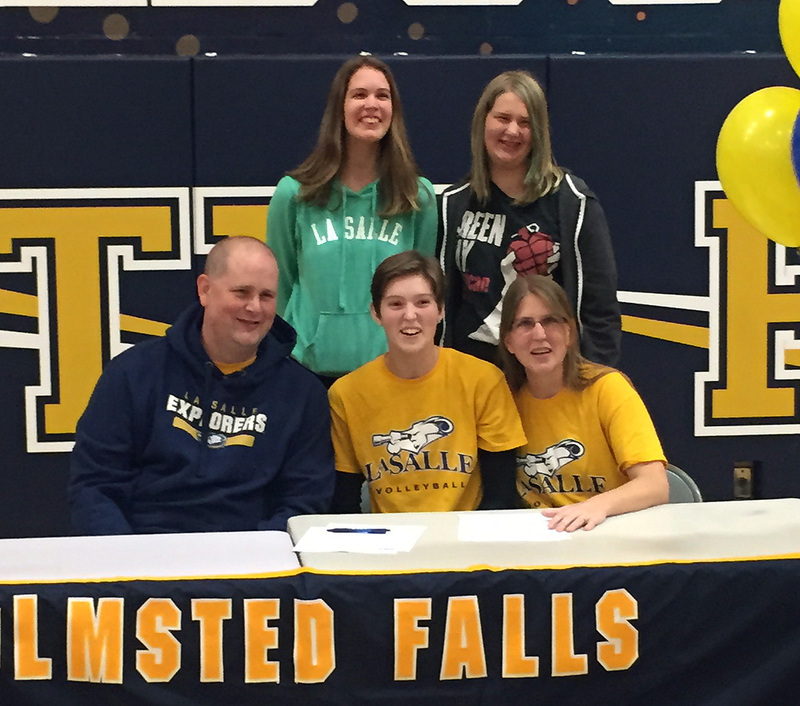 Lexi will play at Lake Erie College next year and Katie, LaSalle University. Congratulations to these fine students and athletes! Olmsted Falls School District is participating in another an on-line auction to sell no longer needed equipment and supplies. 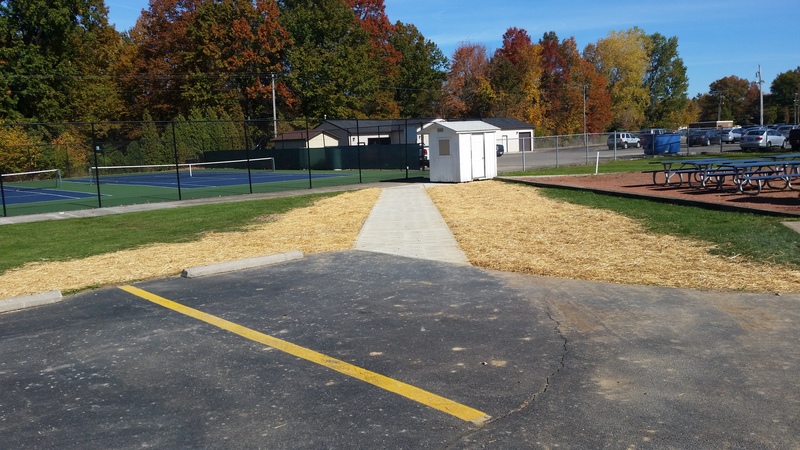 Through its ongoing partnership with the Ohio School Council, Olmsted Falls School District utilizes an on-line auction service to post and sell items no longer being used in District buildings or on District grounds. Over the past 3 years, auction of unneeded furniture, equipment, buses, books, etc. has generated more than $30,000 in sales! Any items not sold during the initial auction cycle are posted again in the next available auction period. Ultimately, items that are not sold through auction are either placed in the District’s metal scrap dumpster, or otherwise properly recycled or placed in the District’s Republic dumpsters for trash pick-up. Items not sold through auction and placed in the District’s metal scrap dumpster also ultimately generate money for the District. Over the past 3 years, scrap metal sales have generated more than $3,200 for Olmsted Falls School District. To access the auction website, please follow the instructions below. Click HERE to access the inventory available through the latest online auction. Olmsted Falls School District auction items begin with title descriptions that start with the letters “OF.” These are the surplus auction items available from Olmsted Falls School District. 2ND GRADE CLASS PARTICIPATES IN CURIOUS CLASSROOM CONTEST – PLEASE CONTINUE TO VOTE DAILY NOW THRU NOV. 30! Mrs. Karen Megery’s 2nd grade class at Falls-Lenox Primary School entered the HMH Curious Classroom Contest sponsored by publishing company Houghton Mifflin Harcourt. HMH is challenging teachers to demonstrate how they inspire learning and foster curiosity in the classroom by submitting videos to the Curious Classroom Contest. The video entry from Mrs. Megery’s class is visible at: http://curiousclassroom.hmhco.com/votes/73. Simply click the link to view their entry and then vote! Everyone gets one vote per day, so visit often! You can vote one a day, every day through November 30th! 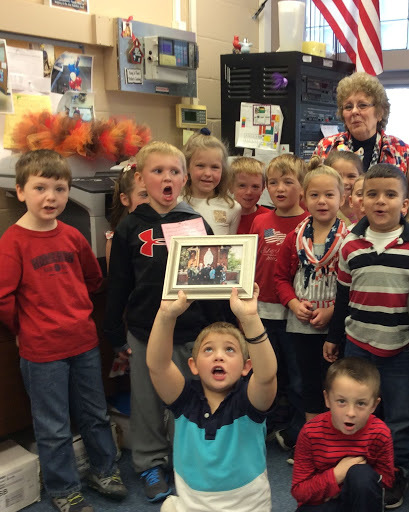 Help Mrs. Megery’s class get the most votes! Top videos with the most votes will advance to the final judging phase – so the more votes the better! A new SMART Board, a classroom set of Chromebooks, and a collection of books for the school are among the top prizes! PLEASE VOTE TODAY, AND TOMORROW, AND THE NEXT DAY, AND THE DAY AFTER THAT, AND….YOU GET THE IDEA! Reserve your spot by Tuesday, November 24th for the Helping Hands Holiday Party December 4th. Enjoy dinner, dancing, crafts and game at the fun event that runs from 5:30-8 p.m. at OFIS cafeteria. 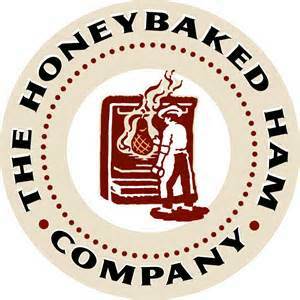 Tony K’s will cater the event. Enjoy pizza, pasta, meatballs, bread, salad and refreshments. Tickets are $10 for those ages 10 through adults; $5, ages 4-11 and free for those 3 and under. Return the form, which is available by clicking HERE, by Tuesday. Contact Mariel Krakowiak, 440-427-6575 or mkrakowiak@ofcs.net, with questions. The new science materials for GRADES 4-5 are now available at the Olmsted Falls Library from November 16th – 30th. Feedback can be provided via the online Resource Review Survey (see additional information below). An email notification was sent all parents about this opportunity. Community residents are invited and welcome to participate as well. Science teachers in grades 4 and 5 have had an opportunity to preview a multitude of Science resources. We had two vendors provide a face-to-face overview of their materials. Teachers spent an entire day previewing the materials and using a quality review rubric to determine the strongest resource. 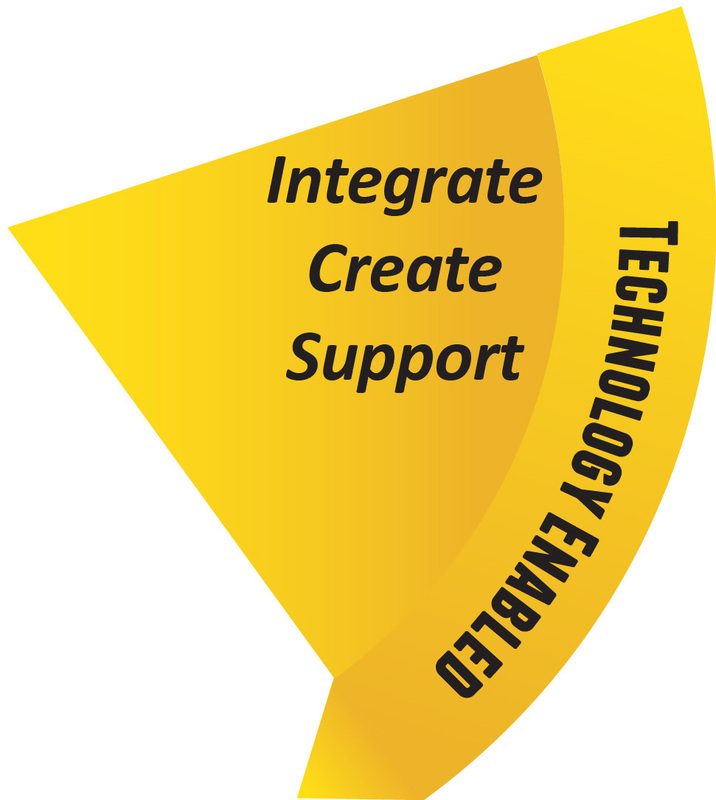 Our teachers have identified Fusion Science from publisher Houghton Mifflin Harcourt as a very strong resource. Parents and community residents are invited to review the materials and submit feedback via an on-line Resource Review Survey. 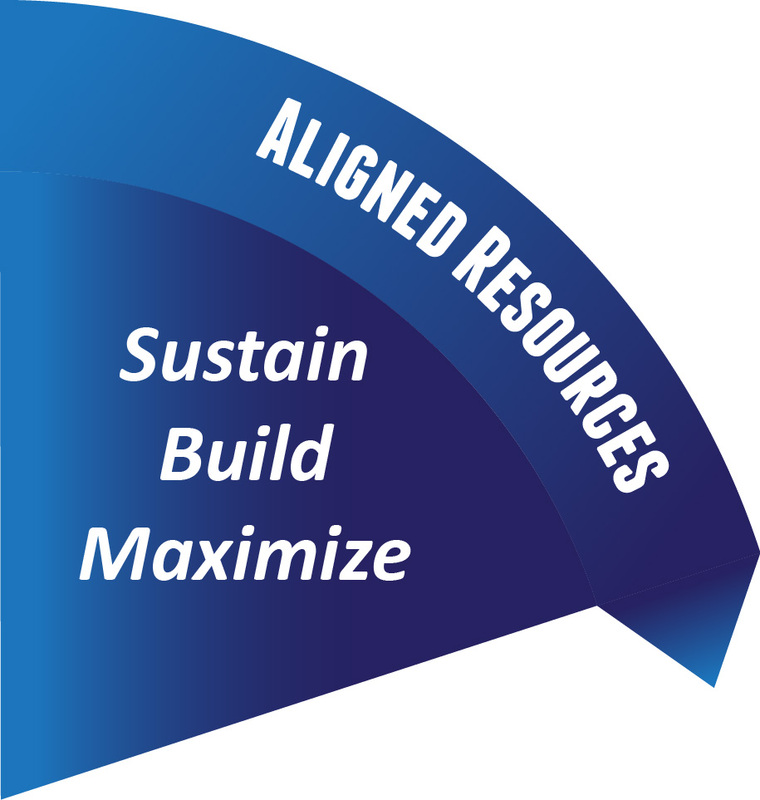 A hard copy sample of the Resource Review Survey questions is provided with each set of materials for reference. The online Resource Review Survey can be accessed by visiting the OFCS website at www.ofcs.net and clicking on the “Science Curriculum Review” Quick Link, located at the top, left side of the page. The weather is turning a bit colder, but one team that represents OFHS suits up in gear fit for the ice. The school’s hockey team begins its regular season November 27th with a tournament. The team’s home rink is in the John M. Coyne Recreation Center on Memphis Avenue in Brooklyn. 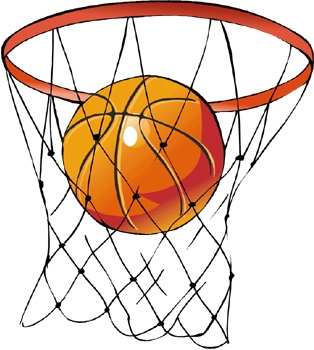 View the teams 2015-16 schedule by clicking HERE. Its alumni game is December 20th. Learn more about a military career, ROTC, college scholarships and academy appointments at the December 1st Military Night in the OFHS Media Center. Representatives from the U.S. Armed Forces and U.S. Senator Rob Portman’s office will talk with you from 7-8:30 p.m. and explain what is available in the military after high school. Parents and students are invited to attend. OFHS will have its last student College Lunch Bunch for those having questions about choosing a college and completing applications. 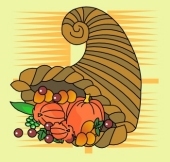 It is Tuesday, November 24th during lunch and study halls in the Guidance Office. Don’t miss your last chance next week. The OFMS PTA has a Schwan’s fundraising campaign that offers a special incentive if ordering by Nov. 27th. All funds raised in this online food ordering and home delivery campaign go toward such programs as Rachel’s Challenge, field trips, assemblies, scholarship and others. 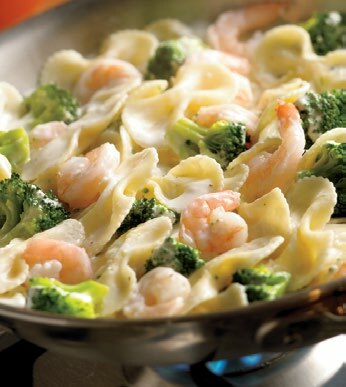 Ordering is quick and easy. Go to Schwans-Cares.com and enter our campaign ID code – 23818 – or “Olmsted Falls Middle School PTA when placing an order. You also may call 1-855-870-7208 and give the rep that same ID code. Through November 27th, 20% of sales and 40% of gift card purchases will go to the PTA. It will still receive 5% of sales after that date. Anyone may order using the ID code, so contact friends and neighbors. Thank you for supporting OFMS PTA. 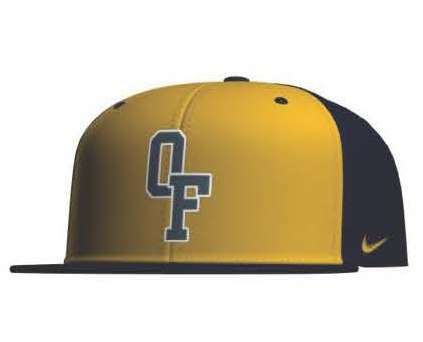 As a fundraiser, the OFHS Ultimate Frisbee Club is selling class hoodies. They are $20 each and can be ordered for the Class of ’16, ’17, ’18, or ’19. The hoodies are blue with gold graphics. Deadline for orders is Thursday, December 4th. Pick-Up in The Pit Dec. 16-18. Order yours today! Download order form by clicking HERE. Use the online option by clicking HERE. Deadline to order is December 17th. Due to requests, the Baseball Hat Online Sale will continue until midnight, Monday, November 23th. The new Nike design for 2015-2016 – flex fit – 3 sizes to choose from. Will be in before the Holidays. 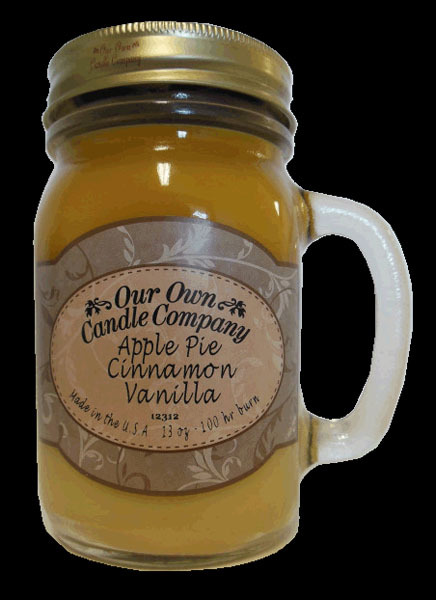 This will be the only time of year they will be available to purchase online and perhaps at all, the rest of the year. Go to www.bsnsports.com/mts and enter code: bulldo9W6. The planning has begun for the Class of 2016 Post Prom. The committee has set up a convenient way to donate perishable/non-perishable food items as well as to sign-up for volunteering opportunities. Please visit www.perfectpotluck.com to donate. If you have any questions or would like to join our committee please email Angela Fanara at amarysiak@hotmail.com. November is Diabetes Awareness Month. Please help Falls-Lenox students raise money to fight this devastating disease. Our Dimes for Diabetes campaign will raise funds to contribute to the Juvenile Diabetes Research Fund. Money may be sent in with F-L students this week and the week of November 23rd. You also may donate online using by clicking HERE. Thank you for help us fight Type 1 (Juvenile) Diabetes. Small Business Saturday is Saturday November 28th and the Olmsted Chamber of Commerce is encouraging the community to shop our local small businesses this weekend. Participate in the #shopsmall photo contest for a chance to win a $50 gift certificate to any Olmsted Chamber of Commerce business. On Saturday, November 28th, people are encouraged to take a selfie at any local business and post to the Chamber of Commerce Facebook page (https://www.facebook.com/OlmstedChamber) using the hashtag #shopsmall, or tweet it to us at @OlmstedChamber . The best photo will win a $50 gift certificate to any chamber business . 4th ANNUAL HOLIDAY SPIRIT TREE LIGHTING CEREMONY – SUNDAY, NOVEMBER 29TH @ 5 P.M. The community is invited to attend the 4th Annual Holiday Spirit tree Lighting Ceremony on Sunday, November 29th at 5:00 p.m. at Olmsted Township Hall (26900 Cook Road). Join us for a brief ceremony, entertainment and refreshments. Celebrate the season at the Olmsted Falls Branch Library’s Holiday Singalong with the Cleveland Fleaharmonics! The songfest begins at 7 p.m. December 1st at the Library. Register by calling 440-235-1150 or go to cuyahogalibrary.org. The Cleveland Fleaharmonics is a ukulele ensemble. 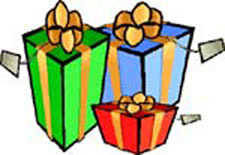 From 9 a.m. to 1 p.m. Saturday, December 5th, Cub Scout Pack 102 will present Santa’s Secret Shop at Falls-Lenox Primary School. Kids may shop for holiday gifts for family and friends with the help of elves. Grownups may buy tickets for a holiday raffle of great items, including an Xbox One game system and Fitbit Flex activity tracker. Admission is free. All proceeds benefit Cub Scout Pack 102. Olmsted Township & Olmsted Falls Police Department invite you to help them “Stuff the Cruiser” at a community food drive being held Saturday, December 5th in the Shaker IGA parking lot from 9 a.m. – 2:00 p.m. The Olmsted Falls Board of Education voted unanimously to approve the launch of an all-day kindergarten program at their regular monthly meeting held on Thursday, November 12th. The all-day kindergarten program will begin in the 2016-2017 school year. All-day kindergarten will be a tuition-based program open to all interested families of incoming kindergarteners in the Olmsted Falls City School District. OFCS will also continue to operate its current half-day kindergarten program for those families interested in remaining with a half-day program. With the formal approval of the Board of Education, more detailed logistics and planning will be getting under way immediately. Additional details will be forthcoming in January 2016 for all families with incoming kindergarteners. Please watch the blog for updates on the new all-day kindergarten program from Olmsted Falls City School District. The Olmsted Falls Board of Education honored two Bulldog students for their achievements in the 2014-2015 PTA Reflections Contest. 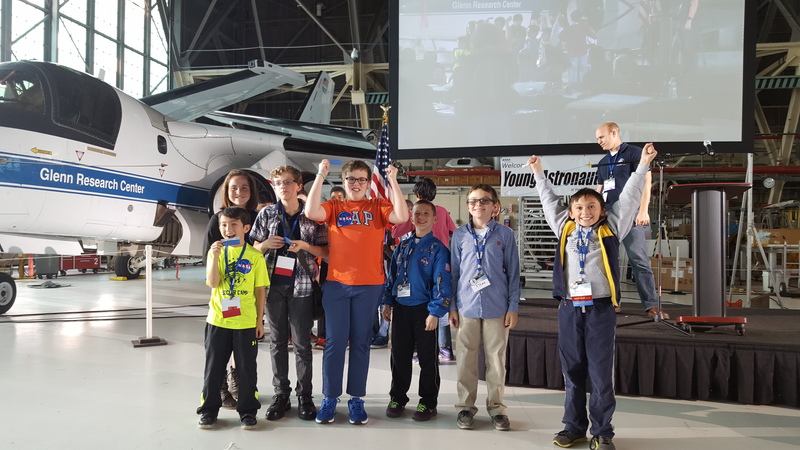 Both students’ contest submissions advanced from the local level to the state level – where each project took 1st place, earning them spots in the National PTA Reflections Contest. Both Michael and Max received Honorable Mentions for their respective entries in the National PTA Reflections Contest in the Intermediate Division. Congratulations to these outstanding students on this impressive achievement! Pictured above: 2014-2015 PTA Reflections Chair Patty Voisinet and Board of Education Member Linda Parkowski help recognize Michael DiFilippo and Max Limpert for their national award-winning Reflections entries. Mrs. Parkowski is currently chairing the 2015-2016 Reflections Committee for Olmsted Falls PTA. OECPTA: Amy Lauderdale – amylaud@gmail.com. 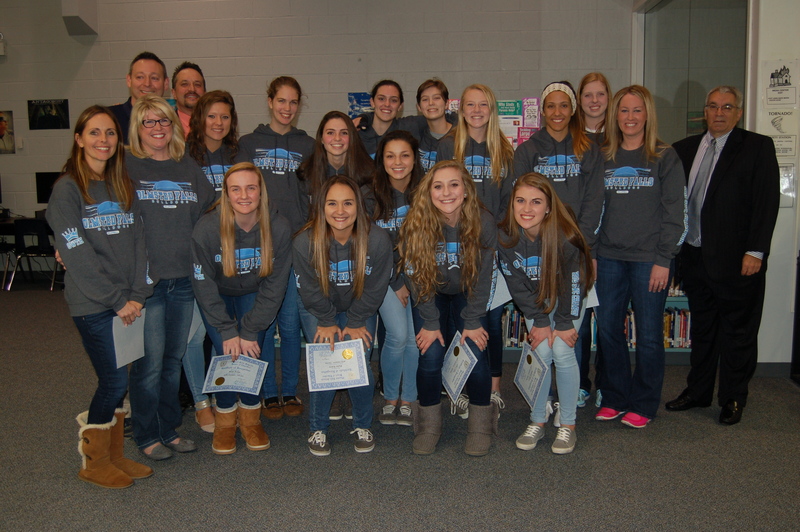 The Olmsted Falls Board of Education welcomed the entire OFHS Varsity Volleyball team to its monthly board meeting to recognize the team for winning the SWC Championship. Players, coaches and long-time voice of OFHS Volleyball team, Mr. Michael Moore, were on-hand to receive special recognition and personal congratulations from the Olmsted Falls Board of Education. The energy was high as Mr. Moore’s signature voice introduced each player and coach individually to much applause from Board members, family, friends and visitors gathered for the special recognition. Please watch for a detailed summary of this team’s amazing 2015 season in next week’s District blog post. For the past two weeks, beginning Monday, November 2nd, Olmsted Falls School District has made available for community review the new science materials for grades 6-8 by placing them on display in the Olmsted Falls Library. Science teachers in grades 6 through 8 have had an opportunity to preview a multitude of Science resources. We had two vendors provide a face-to-face overview of their materials. Teachers spent an entire day previewing the materials and using a quality review rubric to determine the strongest resource. 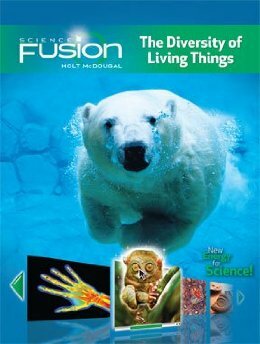 Our teachers have identified Fusion Science from publisher Houghton Mifflin Harcourt as a very strong resource. 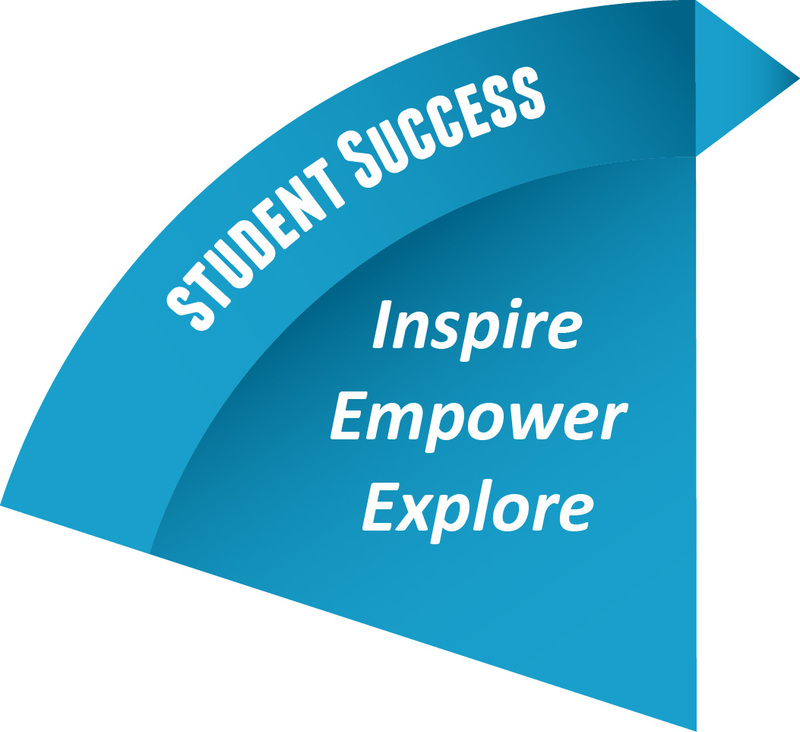 BEGINNING MONDAY, NOVEMBER 16TH, the new science materials for GRADES 4-5 will be available in the same location and with the same opportunity to provide feedback via the online Resource Review Survey. An email notification will be sent to all parents about this opportunity. Community residents are invited and welcome to participate as well. The schools took time last Wednesday to acknowledge those who have served in the military. 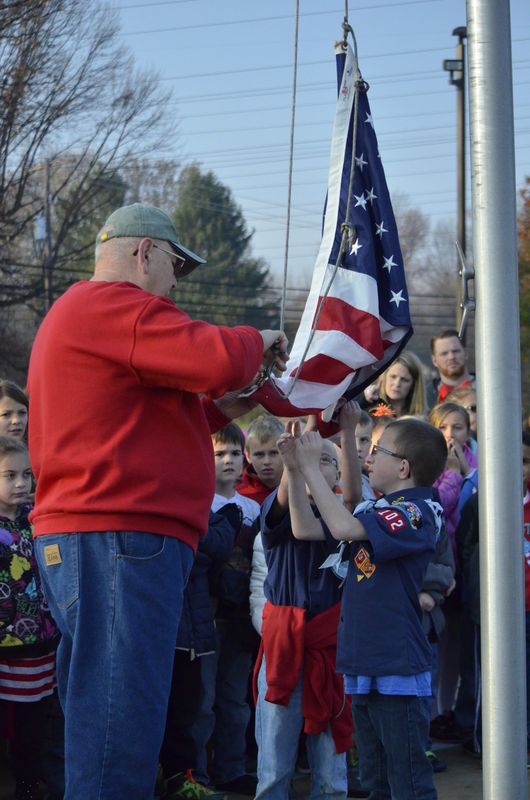 Many had various activities, events and projects that highlighted Veterans Day. Wednesday at Falls-Lenox was a very special day. 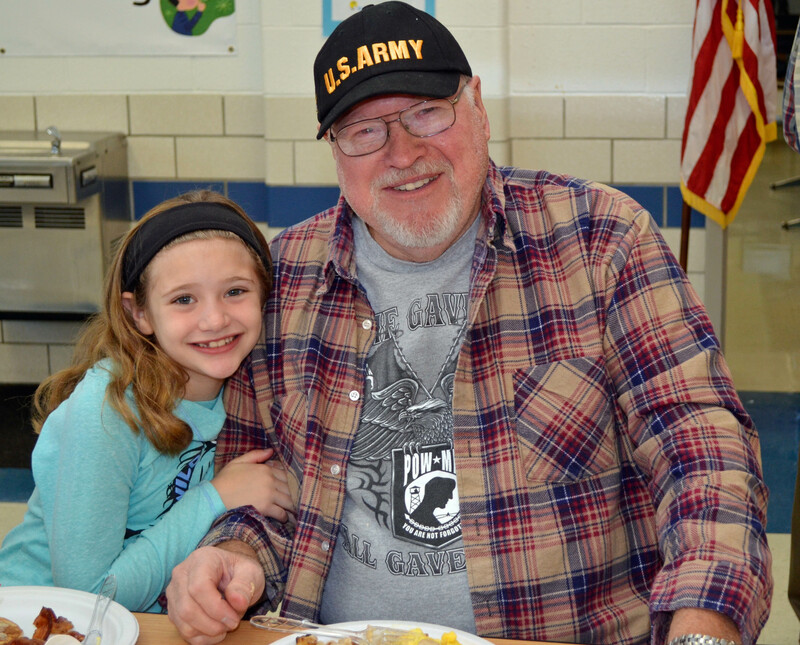 Students and staff worked together to provide Breakfast for over 100 Veterans. First graders decorated placemats and second graders served food. Students donated almost $800 to go towards the breakfast, which meant well over half the cost paid for by the students! The rest was covered by the school and PTA. After the breakfast flagpole ceremonies were held to commemorate this important day. In a real team effort, third grade speakers shared information about Veterans Day, second graders led our songs, and two high school students, Rachel Blair and Max Molkentin, played Taps on trumpet. Special thanks to our Veterans Day Committee and PTA for planning and supporting our Veterans Day activities. It’s wonderful to see how when everyone makes a small sacrifice a big event like this can happen. To view a brief photo gallery of the event, click HERE. 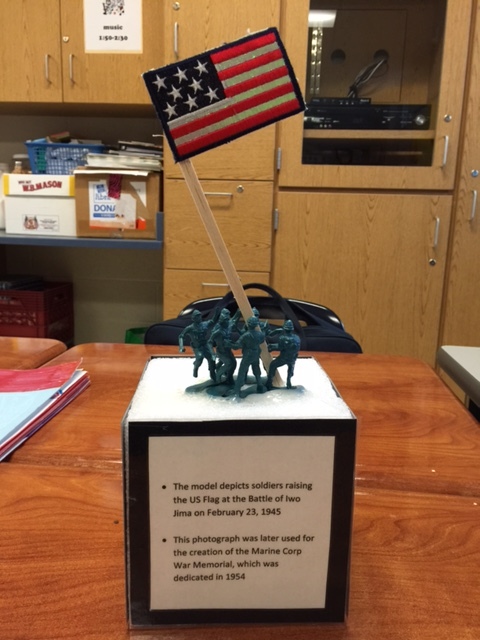 Students in Mrs. Stanczak’s class at OFIS worked on various projects for Veterans Day. Not only did the students create projects in the classroom to learn more about the day itself (see picture at left), but students also made special posters and wrote letters for a community Veterans dinner this weekend in the Cleveland area. Each veteran attending the dinner will receive a brief personal letter from each one the students. Mrs. Doyle’s AM & PM kindergarten classes were honored to say the daily Pledge of Allegiance with Mrs. McClelland in the front office on Veterans Day. Mrs. McClelland is a military mom and wife. She shared her photos and helped the students learn about Veterans. They learned that her son is on leave and just got to meet his baby son for the first time! One of the kindergarteners has been carrying our weekly magazine about Veterans in his pocket in the days leading up to Veterans Day. He asked what he could do to help our military? Give thanks to Veterans when you see them in uniform! A plaque at the entrance of this building lists the names of 17 former students – students who walked these hallways just like you, who died in service to our country. The quote on the plaque, from General George Patton, “Let us not mourn that such men died, but rejoice that such men lived” reminds us that Veterans Day is a time to honor those who gave the ultimate sacrifice for our freedom. 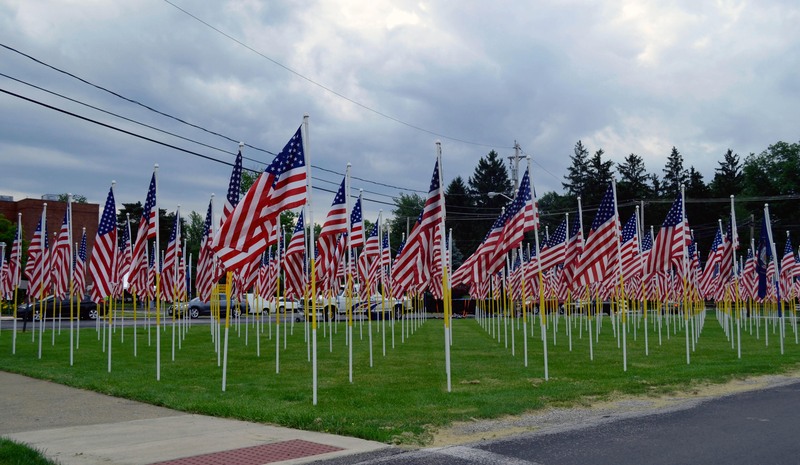 It is also a time to honor ALL who have served our country. 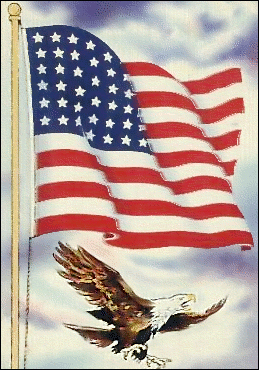 At this time, if you are a veteran or are newly enlisted, please stand so your classroom can acknowledge you. The above activities are just a sampling of the many special activities and events that took place through the District in honor of Veterans Day 2015. This coming week, the OFHS Masquers will present a high impact drama for their fall performance. “Wit,” a story that deals frankly and openly about coping with cancer, has our high school thespians breaking new ground. Also unique to this year’s fall play will be the stage’s “black box” format which puts audience members right on the stage with the cast. To accomplish this sophisticated set-up often found in professional theater productions, an addition has been built on to the front of the stage. There will be only about 150 seats available each night. Performances are November 20th and 21st at 7:30pm. Tickets are $5 for students and senior citizens; $7 for adults. 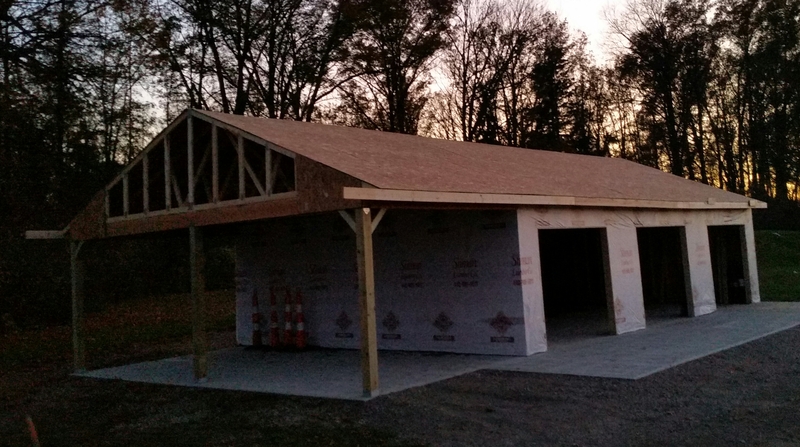 NEW SPORTS STORAGE FACILITY TAKING SHAPE, THANKS TO OLMSTED FALLS ATHLETIC BOOSTERS! 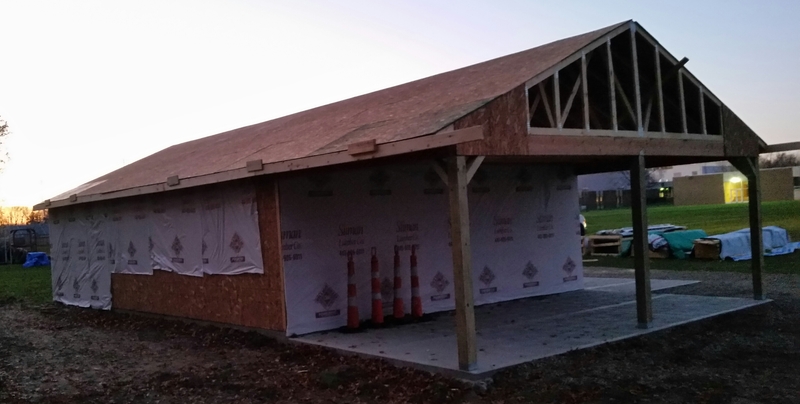 for an athletic storage facility that will house equipment for both the girls and boys sports. Countless hours of work already have been put into this project by many. There still is a lot more to go and with everyone’s support, it will be completed soon. We wish we could say that it was completed “before the snow flies,” but many that were there a few Saturdays ago can attest that the snow was already flying! If you want to find out how you, too, can help, send an email to Jim Polcar at president@ofathleticboosters.org. 2ND GRADE CLASS PARTICIPATES IN CURIOUS CLASSROOM CONTEST – VOTE DAILY NOW THRU NOV. 30! Mrs. Karen Megery’s 2nd grade class at Falls-Lenox Primary School has entered the HMH Curious Classroom Contest sponsored by publishing company Houghton Mifflin Harcourt. HMH is challenging teachers to demonstrate how they inspire learning and foster curiosity in the classroom by submitting videos to the Curious Classroom Contest. Masquers and Forensics Patron Meeting – Monday, November 16th, at 7PM in room W3 at the HS. 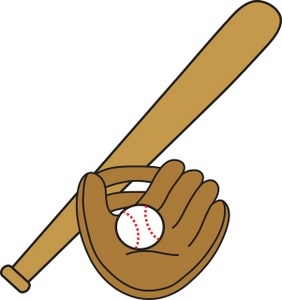 Post Prom Meeting – Wednesday, November 18th, at 7PM in the HS library. The weather is turning a bit colder, but one team that represents OFHS suits up in gear fit for the ice. The school’s hockey team begins scrimmages this week for its regular season that starts November 27th with a tournament. The Middle School Media Center and the LEAD Organizations would like to thank everyone for supporting the recent Book Fair and the fundraiser/raffles during both conference nights. They would also like to extend a huge thank you to everyone who donated items for the baskets, as well as gift certificates. The book fair ended on Nov. 11th and was a huge success! The Media Center will take profit in books which will allow us to purchase new and exciting titles of all genres for the Library/Media Center. In addition, we would like to thank our amazing PTA volunteers for taking time out of their busy schedules to help with the book fair. Special thanks to: Tammy Walston, Heather Kilbane, Nicole Humphrey and Rinda Vas. OFHS continues to offer its student College Lunch Bunch for those having questions about choosing a college and completing applications. They are on selected Tuesdays during lunch and study halls through November 24th in the Guidance Office. A flyer with a list of dates is available by clicking HERE. 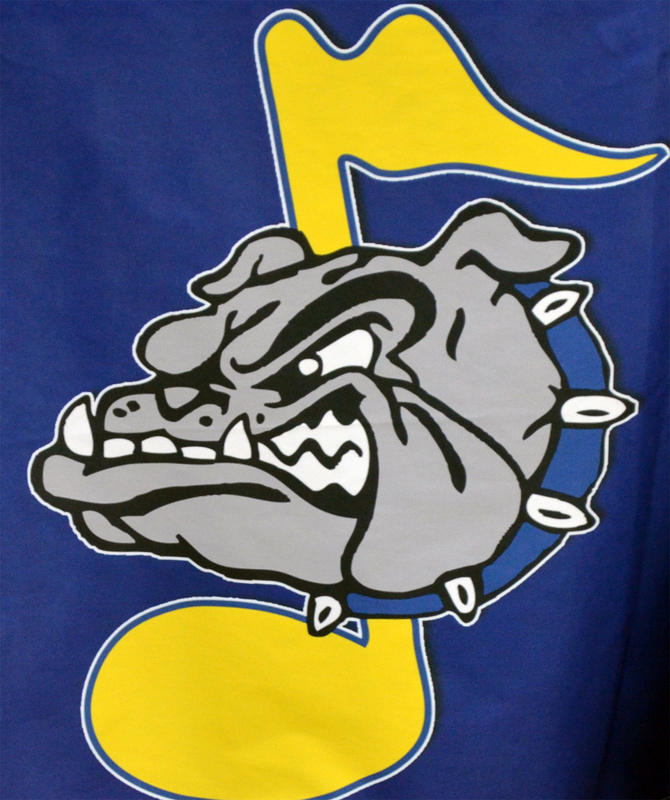 The Olmsted Falls Music Association’s next meeting is 7 p.m. December 3rd in the OFHS choir room. The group enjoyed a successful Fill the Truck fundraiser – thanks to you. Click HERE to see the Musical Notes November issue, photos of that event and much more information occurring with the group. OFMA’S WING/PIZZA IS TONIGHT, NOVEMBER 14TH!! Getting ready for the Olmsted Falls Music Association’s All-you-can-eat wings/pizza/salad buffet, refreshments night Nov. 14th. Tickets are $20 and you have a chance to win a valuable door prize. There also will be side boards and gift basket raffles. A trivia contest highlights the event from 6-10 p.m. November 14th at St. Clarence Church’s main hall, 30106 Lorain Road, North Olmsted.The trivia contest team tables of six cost $15 a person. The theme is “Music Through the Decades.” To view an event flyer, click HERE. 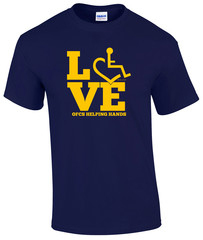 HELPING HANDS T-SHIRTS, HOODIES SALE ENDS TOMORROW – SUNDAY, NOVEMBER 15TH! POINSETTIAS IN EACH ROOM IN THE HOUSE? WHY NOT? Who doesn’t like poinsettias at Christmas time. The OFHS National Honor Society again has its Poinsettia Sale from November 13th to December 16th. Sizes and prices are $5 for 4-inch plant; $7 for 6-inch; $11 for an 8-inch florist pot and $15 for a 10-inch plant.. Color selection are red, pink and white. Baseball Hat Online Sale now through 11/17. All new Nike design for 2015-2016 – flex fit – 3 sizes to choose from. Will be in before the Holidays. This will be the only time of year they will be available to purchase online, and perhaps at all, the rest of the year. November is Diabetes Awareness Month. Please help Falls-Lenox students raise money to fight this devastating disease. Our Dimes for Diabetes campaign will raise funds to contribute to the Juvenile Diabetes Research Fund. Money may be sent in with F-L students during the weeks of November 16th and November 23rd. You also may donate online using by clicking HERE. 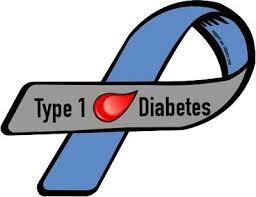 Thank you for help us fight Type 1 (Juvenile) Diabetes. Description: Join us on the third Thursday of the month to help plan programs, do activities, and more. Your input helps decide what we do! To sign up, click HERE. You’re invited to the annual Holiday Home & Craft Shoppe from 9 a.m. to 4 p.m. this Saturday, November 14th at Olmsted Community Center. It’s a great way to get a head start on holiday shopping while supporting the center and local vendors. Upscale gifts and homemade crafts are some of the featured vendors. Bring your children to the kids workshop to make gifts for grandparents, siblings and teachers. Concessions are available. The 23rd annual Santa’s Secret Shop, which Olmsted Falls Cub Scout Pack 102 sponsors, is from 9 a.m. to 1 p.m. Saturday, December 5th. 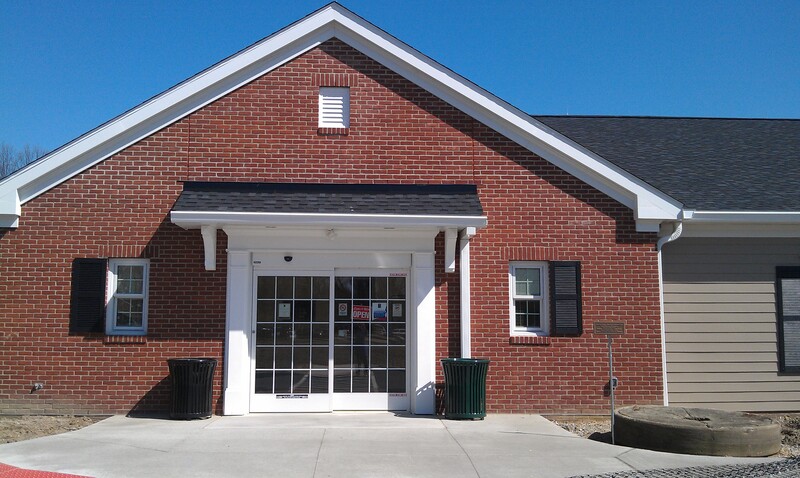 The shopping event is at Falls-Lenox Primary School. Kids may shop for holiday gifts for family and friends with the help of our elves. Grownups may buy tickets for a holiday raffle of great items, including a Xbox One game system and Fitbit activity tracker. Admission is free. All proceeds benefit local Cub Scout Pack 102. Congratulations to incumbent Board of Education member Greg Surtman and newly elected Board of Education member Brian Weisbarth, who were elected to the two open seats on the Olmsted Falls Board of Education. This will be Mr. Surtman’s second term as a school board member, and Mr. Weisbarth’s first term. 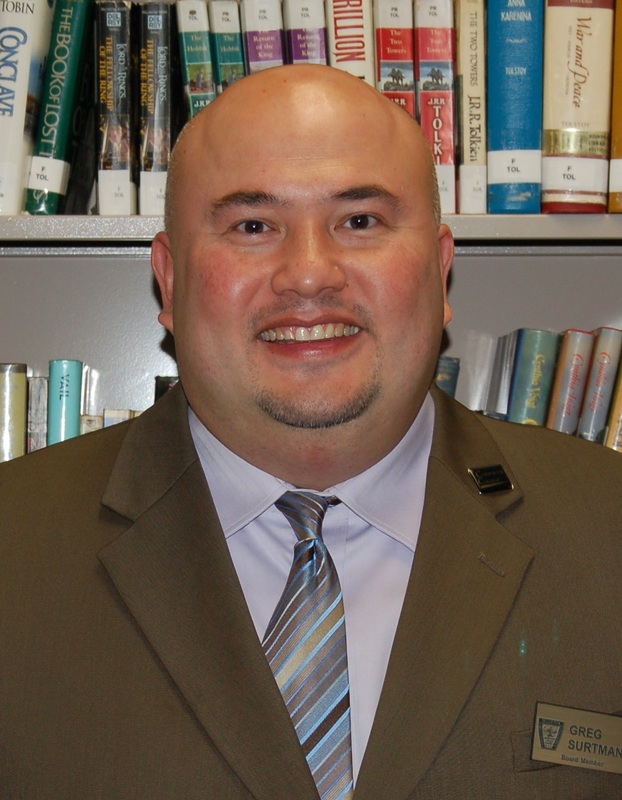 Mr. Surtman has served on the Olmsted Falls Board of Education since January 2012. Mr. Weisbarth will officially be sworn in and begin his term in January 2016. Both elected Board members are active in the community and have students currently enrolled in the school system. Congratulations again to Mr. Surtman and Mr. Weisbarth! Falls-Lenox School hosted three Family Math Nights to help parents learn more about the new Bridges math program. The parents were appreciative of all the different stations. The feedback from those attending was very positive all three nights. evenings of fun math activities. Students enjoyed working on Chromebooks surfing math websites and resources, playing math games and learning about Number Corner with their parents. Thanks to all who attended. To view a photo gallery of grade 1 math night, click HERE. 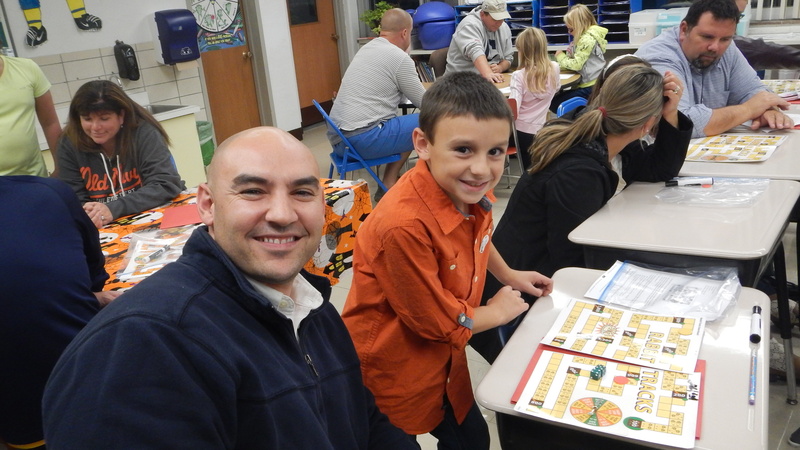 To view a photo gallery of grade 2 math night, click HERE. To view a photo gallery of grade 3 math night, click HERE. Olmsted Falls City School District’s Strategic Plan has been spotlighted in the recently published Olmsted Falls Magazine. To read a copy of the article titled, “Raising the Bar: Driving School, Student Success,” please click HERE. 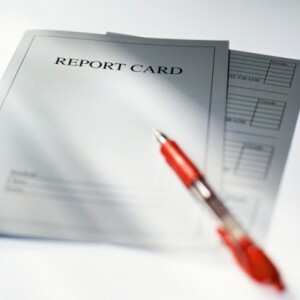 There are approximately 450 policies that govern the Board of Education’s decision making at the Board of Education will be doing its due diligence by conducting a full review of them. 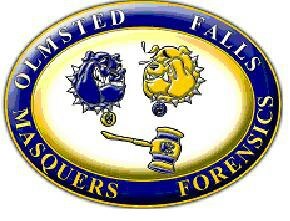 The Olmsted Falls School District contracts with an organization called NEOLA. 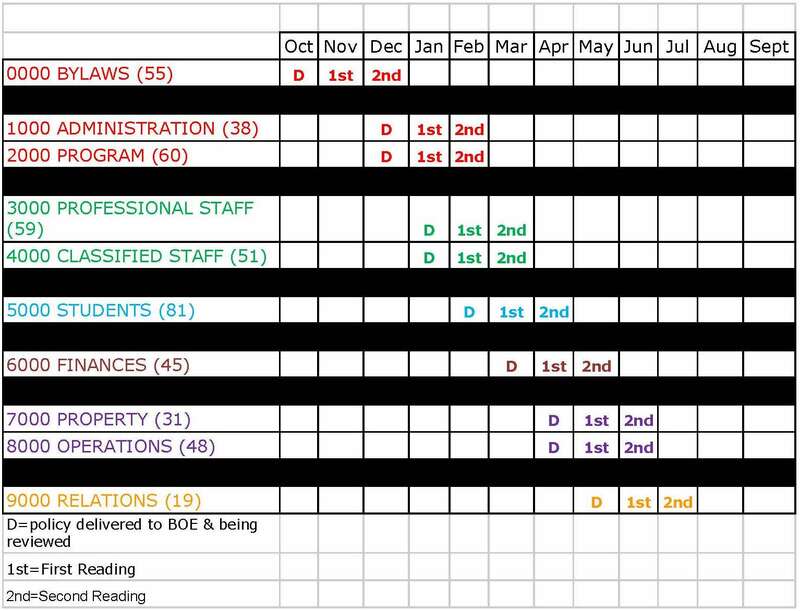 NEOLA works with many school districts across the United States and their primary job is to present those policies that are required by Federal and Ohio law and also to present the Board with optional discretionary policies. Essentially, NEOLA provides School Boards with suggested policy that is then discussed with the full Board in a public meeting. The Board is required by its own bylaws to place any policy up for review onto the agenda two times prior to approval. While all Board Members are part of the review process, a subcommittee consisting of School Board Members Linda Parkowski and Holly Neumann will be working with the Superintendent Dr. Jim Lloyd and Director of Pupil Services Mr. James Tatman to conduct the initial review. This group will be initially responsible for conducting the policy reviews in order to ensure all policies to ensure they are compliant and up-to-date. The policy review timeline is contained in the graphic below. Due to the Bulldog football make making the playoffs, there will be no Blue/Gold scrimmage this Saturday, November 7th. The Alumni Game, however, is still scheduled and will be played from 4-6 p.m.
Come cheer on former Bulldogs on the court! 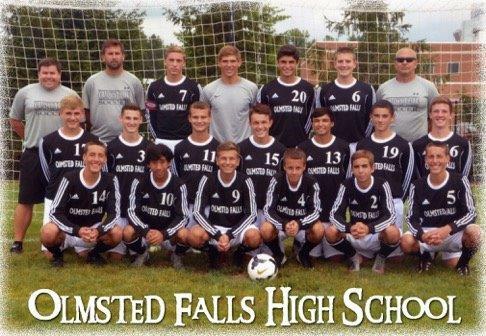 This 2015 OF boys varsity soccer program had a very successful year – on the Varsity and JV levels. The JV team finished the year with a 9-2-5 record. 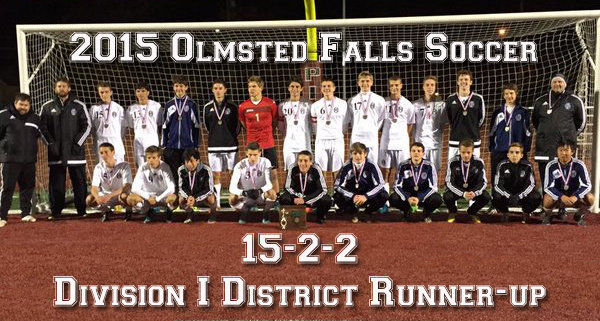 The varsity had a record-setting performance, posting a 15-2-2 record in route to a third place finish in the SWC, an OHSAA Sectional Championship and an appearance in the OHSAA District Final, where the team was awarded the District Runner-Up trophy. That game saw a heart-breaking double overtime, sudden death penalty kick loss to Strongsville. The team set new school records in wins – 15 – and shutouts – 11 – as well as being ranked in the top 10 in the District 1 Coaches poll. The final week had the Bulldogs ranked #3, something that has never been accomplished in the program’s history. In route to its best season on record, the Bulldogs defeated one of the top teams in Toledo as well as state-ranked Berea-Midpark. Academically, this group of Bulldogs was strong as well, earning the program’s 8th All-Ohio Team Academic Award and the program’s 5th National Soccer Coaches Association of America Award for Academic Excellence. Assistant Coach Mr. Joe Starek was also honored by being named the Greater Cleveland Scholastic Soccer Association’s Assistant Coach of the Year in Division 1. During the past four years, the boys soccer team has compiled an impressive record of 41-19-7 against Division 1 and Division II opponents. Members of the varsity team are Austin Mitchell, Bobby Illig, Cameron Robinson, Rylan Wikle, Joseph Linder, Josh Aubel, Austin Lockhart, Ryan Koloick, Mickey Kasputis, Joe Bement, Kevin Lemin, Daniel Linder, Jake Yeager, Charlie Watters, Chase Fernkorn, Logan Klink and Jake Lindley. Congratulations, team, on a great performance. 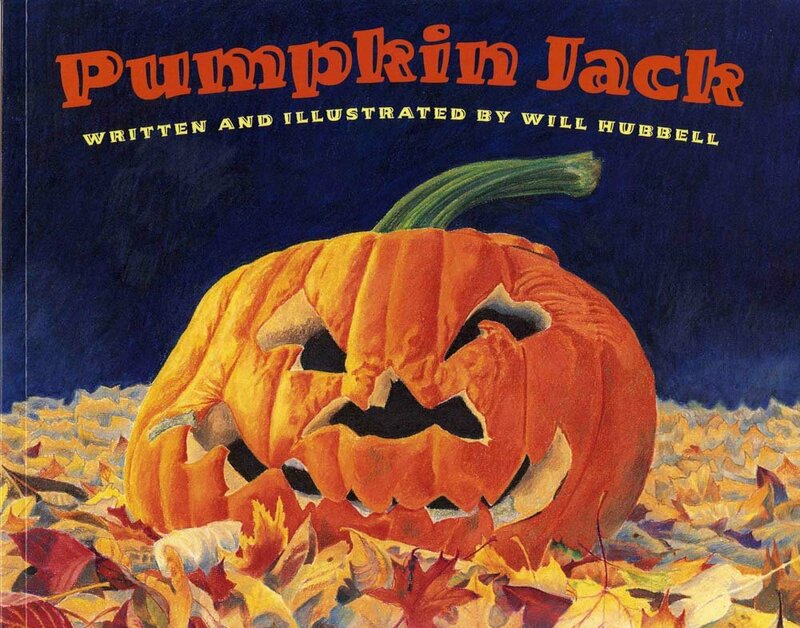 This week, the kindergartners read a story during library time called Pumpkin Jack. The book describes the life cycle of a pumpkin throughout the seasons. 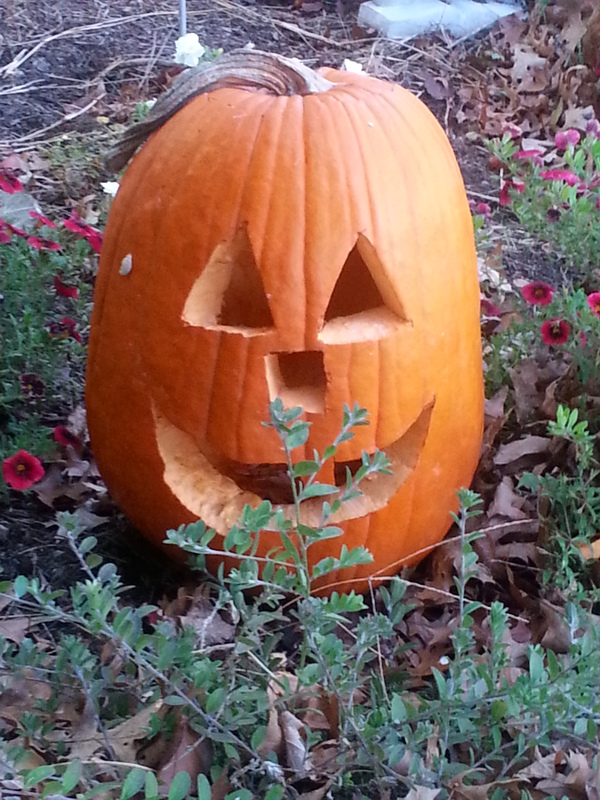 It goes from jack o’lantern to seed to pumpkin and back to jack o’lantern again. The Early Childhood Center now has its very own Pumpkin Jack in the planter at the entrance of the building (pictured at right). We will be keeping an eye on him for the remainder of the year to see what changes occur. The hope is that by next fall Pumpkin Jack will return for a new crop of kindergartners to enjoy! It is time for Olmsted Falls School District to update our Science materials for grades 6 through 8. Science teachers in grades 6 through 8 have had an opportunity to preview a multitude of Science resources. We had two vendors provide a face-to-face overview of their materials. Teachers spent an entire day previewing the materials and using a quality review rubric to determine the strongest resource. 2ND GRADE CLASS PARTICIPATES IN CURIOUS CLASSROOM CONTEST – VOTE DAILY NOV. 1-30! 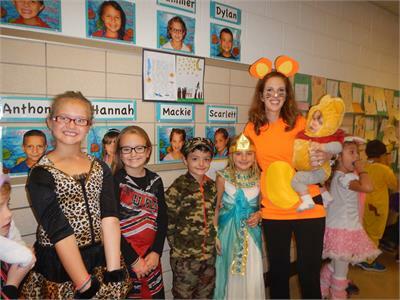 Fun and festive parades marched through and around some OF schools last week for the annual Halloween celebrations. Many parents were on-hand to see the children enjoying the day dressed in their many colorful and creative costumes. To view photo gallery from ECC, please click HERE. To view photo gallery from Falls-Lenox, please click HERE. To view photo gallery from OFIS, please click HERE. The OFIS Student Council sponsored a “No-Holds-Barred Halloween Hallway Contest” between the 4th and 5th grades during the week leading up to Halloween. Thanks to the special judges who walked the hallways to determine this year’s winner. 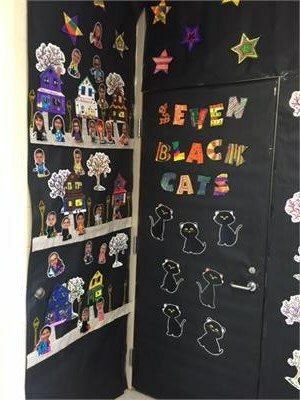 It was a tough decision with so many awesome and creative door designs. CONGRATULATIONS TO 4TH GRADE for being the winning hallway! To view a photo gallery of ALL the amazing doors, please click HERE. *This show deals frankly and openly about coping with cancer and is not suitable for younger students. 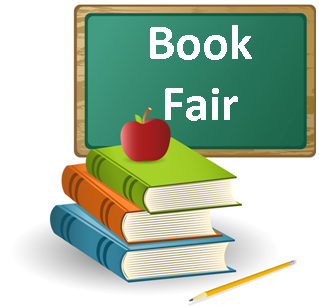 The Olmsted Falls Middle School Media Center is hosting a Scholastic Book Fair now through Wednesday, November 11th. The fair will be open during November 5th conference evening. 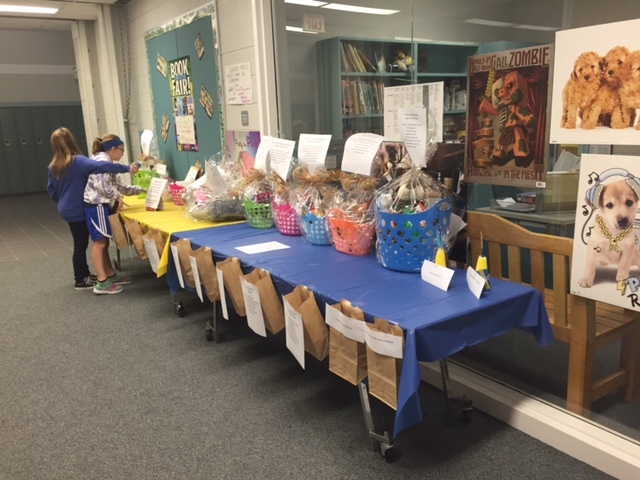 In addition to the book fair, the Media Center is joining with Builder’s Club, Student Council and Helping Hands to raise money for local animal shelters by having a fundraiser with raffles, guessing games and prizes. This event is in the Middle School Media Center. All students are encouraged to stop in and enter their name in a drawing to win a $10 shopping pass for the book fair. All proceeds from the raffle will go to the animal shelters. Please watch this weekly blog and look for posted flyers in your school for more details. The Act Information Sheet needed for Auditions can be found by clicking HERE for those interested in filling it out in advance. Sheets will also be available at the sign-in table on the day of the auditions. 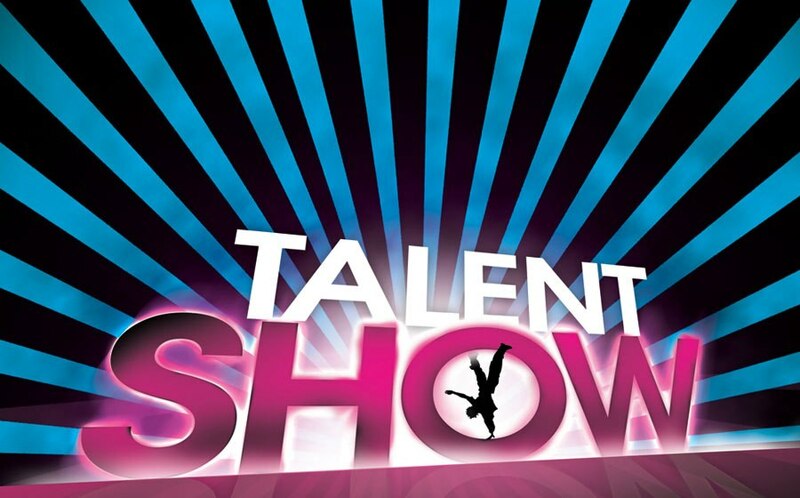 The High School PTA Talent Show will be Saturday, January 30, 2016 – Mark your calendars! S ave the Date for Santa’s Secret Shop! Mark your calendars for this year’s Santa’s Secret Shop on Saturday, December 5th, from 9 a.m. to 1 p.m. at Falls-Lenox Primary School. This event lets kids shop for holiday gifts for family and friends with the help of our elves. Grownups can buy tickets for our holiday raffle of items including an Xbox One game system. Admission is free. All proceeds benefit Cub Scout Pack 102 in Olmsted Falls.